Everyone would like more money in the bank at the end of the month. The good news is that it’s never too late to start saving and investing. Here are some tips to help you grow your wealth by creating a budget. Start saving now. Financial advisors recommend having at least three months’ salary saved in case of emergency. Even if you can’t afford to save a lot of money each month, it’s important to put a small amount away regularly. Track your income and expenses. Every budget starts with knowing how much you’re earning and spending. Use a spreadsheet or online budgeting tool to record your after-tax income and expenses. Set goals. By setting goals, you can make smarter budgeting choices and keep your spending on track. Make a list of what you’d like to achieve over the short, medium, and long terms and record how much you can allocate to them every month. Follow the 50/30/20 rule. To differentiate between your “needs” and “wants,” put 50 percent of your income toward fixed expenses (“needs”), 30 percent toward variable expenses (“wants”), and the remaining 20 percent against your financial goals. Track your spending. Tracking your spending over time helps you understand the impact of impulse buying versus contributing to longer-term goals. Get in the habit of recording your daily expenses. Get everyone involved. A budget only works if everyone in your household commits to it. Make sure everyone understands what’s expected of them and hold regular meetings to review everyone’s spending. Schedule bill-paying days. Banks, credit card companies, utilities, and cell phone companies all bill on a monthly cycle. Create calendar alerts and stick to them to avoid missing a payment and incurring interest charges. Pay your credit card balance in full every month. Your balance will quickly grow beyond your means if you only make the minimum payment. Charge only what you can afford to pay off every month, even if your credit limit is much higher. Pay attention: Many budget items can change over time. You may get a raise, or you may have achieved a goal. Conversely, food prices may go up, or your car may need an unexpected repair. 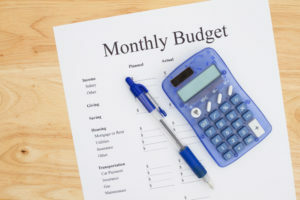 “10 Tips For Managing Your Household Budget.”ABM.2019.https://abm.emaplan.com/ABM/api/v1/StoredFile/6e2e9557-49e1-475f-8375-5effdb93f44e/download.